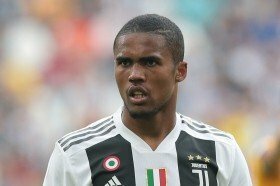 Manchester United could reportedly face competition from Paris Saint-Germain in the race to sign Douglas Costa from Juventus. The Brazilian joined the Bianconeri on a permanent basis from Bayern Munich last summer following a temporary stint, but he has since struggled for gametime with just seven starts in the Serie A. This has triggered the speculation that he could part ways with the Bianconeri during the summer with long-term suitors United highlighted as one of the possible destinations. According to L'Equipe, the Red Devils are likely to make an approach to sign the former Bayern ace but they could face a transfer tussle with Paris Saint-Germain. Costa is currently valued at around £60m by the Bianconeri and it remains to be seen whether the Red Devils are prepared to match that figure, given he would be turning 29 this year. Manchester United are currently fifth in the league standings, two points adrift of fourth-placed Arsenal. They entertain Watford in their next game following the international break.